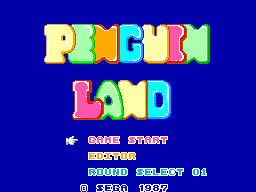 Penguin Land is one of those games having a very individual concept. Therefore, it can be recommended to just about anybody who wants to play something totally different. 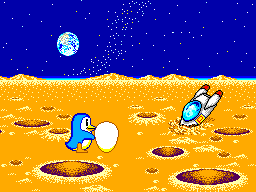 Your mission is very easy to understand, but not always easy to play: rolling a huge egg through the icy stages. You have to play 50 stages, that usually take about five minutes to play through. 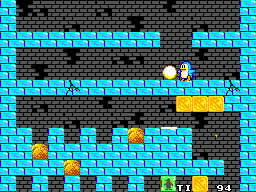 Each stage starts atop the level and you have to get the egg to the very ground. Overbite (the penguin you play) can peck the rocks in front of him and jump. This is all. There are about 10 different types of rocks, each having its own characteristics. Some stones can be moved, some fall apart when placing the egg onto it, some can be removed by peckking and so on. This is were the strategic part begins. So if you don't want your egg to be trapped somewhere, you sometimes have to think twice what rocks to move. And do not forget about the polar bears that always like to punch the §$%? outa Overbite in order to get the egg. The graphic is very simple. The only major thing changing throughout the game, is the color of the background. This sometimes make the game appear a little dull. To cheer up the entire thing visually, Overvbite sometimes smokes or lays on the floor crying. Overall, the one main jingle is the one when playing the stages. It is very catchy (could be amongst the SMS top 10) and creates happiness when playing. Unfortunately, it is played throughout the game, which makes the game appear very monotone in this regard. There are about a dozen of sounds appearing throughout the game, none of them is very special nor disturbing. The game can easilly played without reading the manual. The only thing very rarely disturbing in this regard, is when you lock Overbite away from the egg, and you have to wait until the egg geets crushed. I played the game about 8 times through. Because it is fun to do so once in awhile. Playing a level can be compared to solve a crossword or a set of Sudoku. It is very fun playing it for 20 minutes once in awhile and since the cartridge is smart enough to memorize the level you have reached, I sometimes do so. As already mentioned the big plus of the game is its unique concept - therefore if you want to play something different during lunch break - Penguin Land would be a good gaame to do so. And it would not keep you from returning back to work, maybe only 2 or 3 times .